Some people ask me why I have so much nail polish or "how do you find time to paint your nails so often?" I just MAKE time for it. 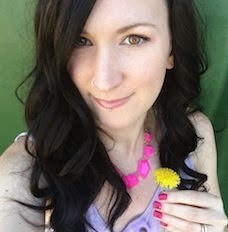 I'm a mom of four kids and life is so busy and crazy but I really need the alone time and the things that are just for me, like painting my nails. Essie Weingarten, the creator of Essie polish said in an interview that when she was a kid, she was a complete tomboy, but her mom took her to the beauty parlour every week after ballet class to get her nails done. It was her treat. I do the same thing except on a daily/every-other-day basis. I will sit down in the evening after the kids are in bed and treat myself to a fresh manicure (and when you paint your nails that often, you get really good and fast at it). 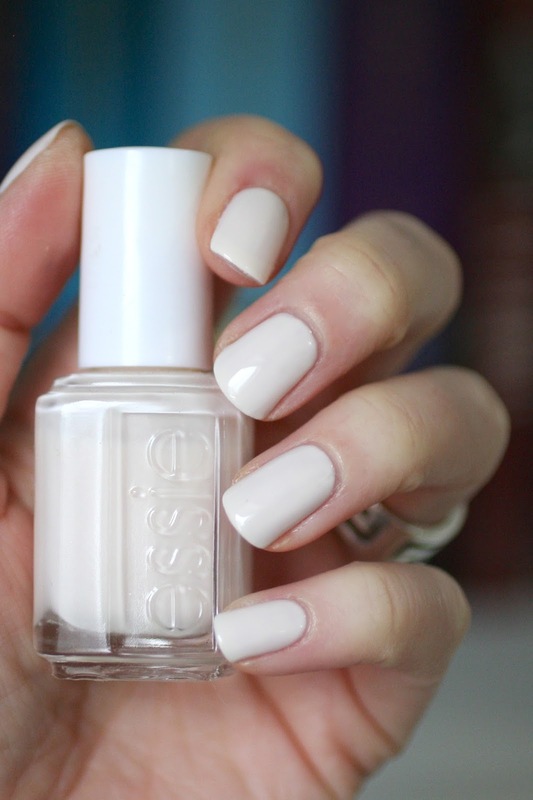 This pretty, slightly off-white polish was one of Essie's first 12 polishes she ever created. It's such a classic colour that it's still in the core collection 36 years later! Once I found out this was part of the original 12, I HAD to order it. 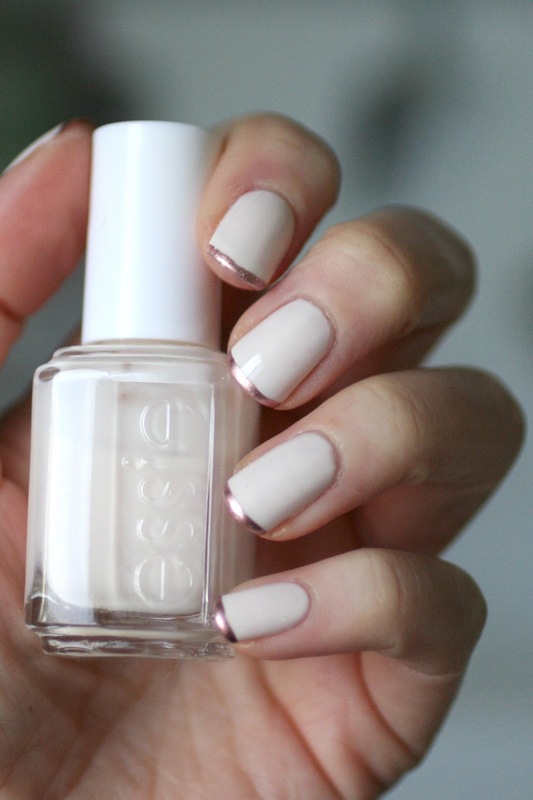 Essie created this colour to be used as a natural looking french tip. For a modern update, I painted Baby's Breath over my entire nail and then used a pink metallic as the french tip. I'm loving the rose gold against this soft white! I make time for other non-mom things besides painting nails. I don't want to just cook and clean and drive my kids around all day, so I like to nurture things that I really enjoy like blogging, writing, reading, book club, running, listening to music...the list goes on! I actually ran a half-marathon a few months ago. I love to throw in my headphones and hit the pavement. It helps to declutter my brain and I can disappear into the rhythm of the music and the pounding of my feet. 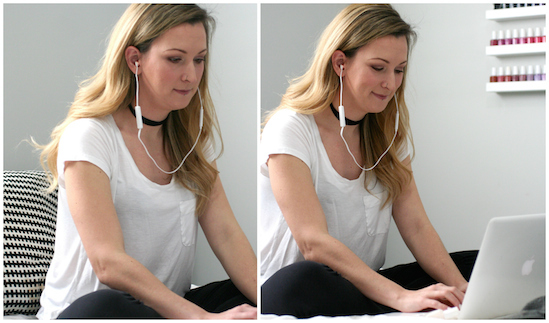 My Sudio* wireless headphones are awesome for throwing in and going for a run or when I want to sit back and listen to music while I blog. 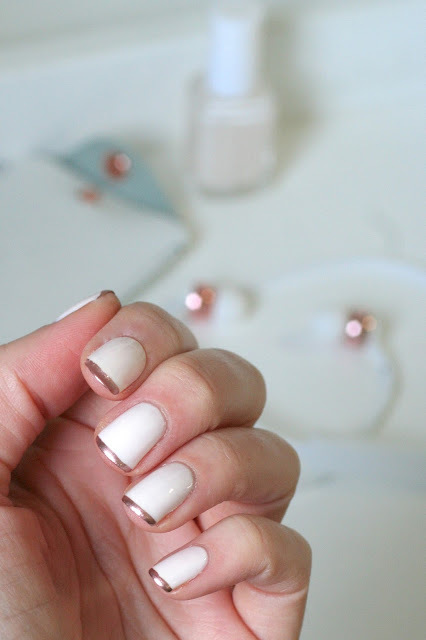 The white and rose gold is a really pretty and classic combination. They are easy to turn the volume up and down since the controls are right there and there's also a built in microphone so I can answer my phone without actually touching my phone. 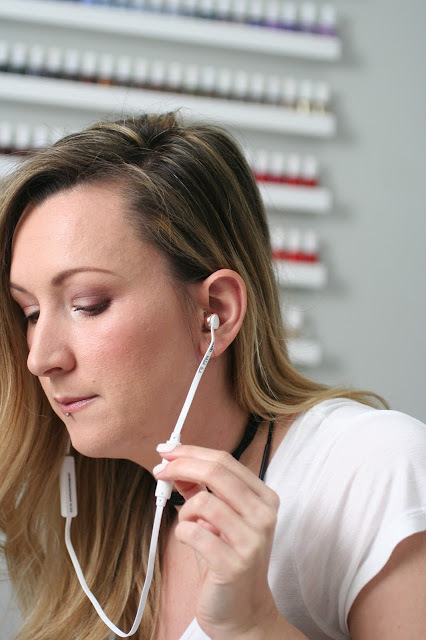 These are perfect features for a mom who's busy and on the go! Sometimes I have guilty feelings and start to question "do I have too many bottles of nail polish? ", "am I really going to paint my nails AGAIN just so I can take pictures and blog about it? ", "is it okay to go for a run and escape for a bit?" But I have to remind myself not to listen to that guilt. Of COURSE it is okay do things you love and treat yourself! All of these interests are a part of who I am. So I'mma keep collecting my bottles of Essie polishes and sharing them with you. Including, buying random white polishes (when I already have a bunch) simply because it's an OG classic. Does anyone feel me on this? Do you ever have guilty feelings over how often you paint your nails or how many bottles of polish you have? Do you make time for yourself and do things that you love? I'd love to hear what you do! *P.S. I was sent these headphones for free. I was not paid to write this post and all my words and feelings are my own. I genuinely love these wireless headphones. 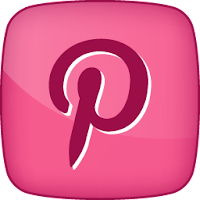 If you want to check them out for yourself, go HERE. They were kind enough to give me a discount code: Use essieenvy to get 15% off. 100%. Constantly feel guilty as my husband doesn't buy things for himself like that and I'm always saying I don't need a new polish ever I have enough! And then I see one I love and can't help myself! My job keeps me so busy I have to take time to relax I just told a friend I was busy tomorrow night- busy doing nothing alone at home! You have to take the time and make yourself happy or you're not living your life for you you're living it for others. Yup! I feel guilty like that a LOT, so thank you for taking the time to remind us that it's important to "treat yo'self" once in awhile, especially when it's such a small-scale (and relatively cheap) treat. I know lots of people with MUCH more expensive hobbies than this! :) Thanks for sharing your thoughts with us! N, DancesWithHooves & Adry - thanks for commenting! This was as much a reminder for me as it was to everyone else. Guilt can weigh on my mind but it really doesn't need to. Treat yo self!